This recipe merges the delicious wonders of a burrito bowl with the savory thickness of warm chili. This ultra-healthy hybrid is perfect on a chilly day or when you’re pressed for time and crave a satisfying supper. 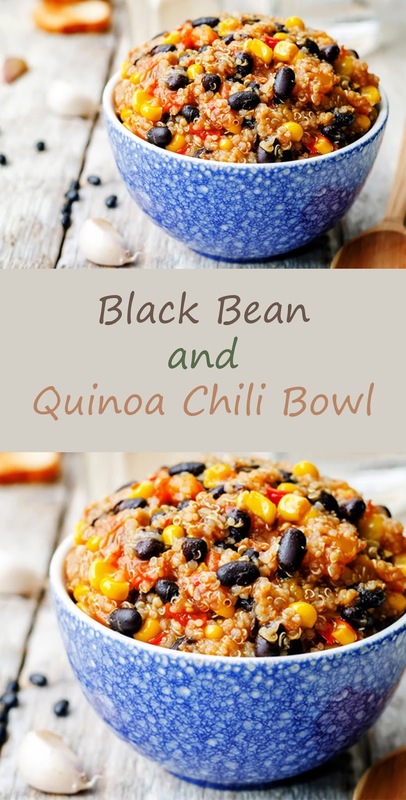 Our vegetarian Black Bean and Quinoa Chili Bowl pairs juicy fire-roasted tomatoes and flavorful corn kernels with warm, hearty black beans. Quinoa adds nutty texture and a host of health benefits thanks to its status as a nutritional powerhouse. 1. Sauté onion and bell pepper in skillet with olive oil over medium heat for about 5 minutes, until the onion is softened and translucent. 2. Add minced garlic. Cook for an additional 30 seconds, until golden and fragrant. 3. Stir in stock, diced tomatoes with juice, quinoa, salt, chili powder, cumin, and cayenne pepper. 0 Response to "Black Bean and Quinoa Chili Bowl"